Midday was fast approaching and serenity had fallen over the ramshackle bulwark of Masroor Temple. Most people had sought out a shaded spot indoors or by the chai stall conveniently set up beneath a large tree. The chai wallah snoozed on his charpoi; nobody cared much for tea at this hour. Looking north towards Tibet, verdant foothills gave way to the blue buttress of the Dhauladhar, which stood like sentries, guarding the Himalayas from some unimaginable mythical foe, or perhaps a spiritual one. This was where the plains of northern India began, where autumn was still burning up summer’s final reserves of heat. Masroor Temple is only an hour’s drive from McLeod Ganj – the headquarters of the Tibetan government-in-exile – replete with its throngs of spiritual questers and Buddhism enthusiasts, but this magnificent temple appears to be oft overlooked. There was barely a sound, save for the occasional chirp of a bird, or the soft susurration of insects. Perhaps the displaced capital of Tibetan Buddhism is more fascinating to the outsider and Masroor is seen as just another Hindu temple. The country, after all, is perhaps unrivalled in its wealth of cultural heritage. A plethora of old ruins and temples are scattered liberally across her countryside, ranging from the outright majesty of some to those that have seen better days and little restorative funding. A group of young children erupted out of a small primary school close by during their lunch break and frolicked in the shade of the temple, the only other man-made construct in sight. The chai wallah sat up and rubbed his eyes as two young boys tried to push one another into the muddy green pond, the surface of which thankfully remained unbroken. Only a plant, boasting delicate pink flowers, was collateral to the friendly scuffle. They were given a curt reprimand and ran off, leaving the temple in peace once more. 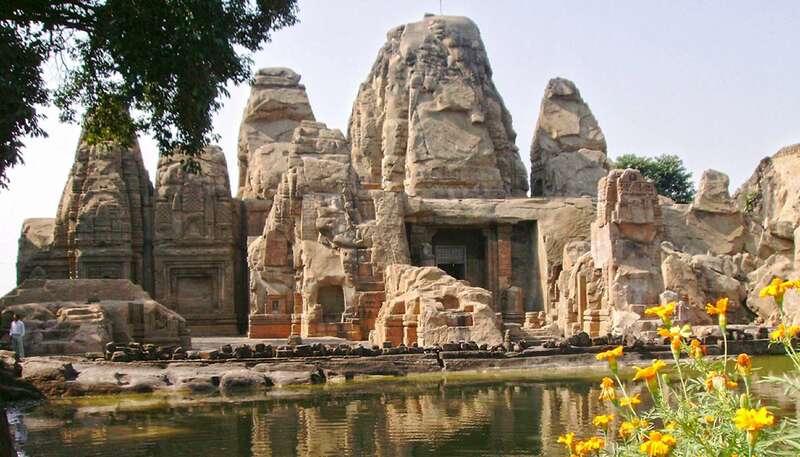 One of only a small number of rock-cut temples in all of India, Masroor is an uncut diamond; there’s a certain dishevelled majesty to its crumbling shikharas (towers) and unfinished carvings. It’s hard to pinpoint the real history of the temple, as it escaped infamy or recognition in recorded documents until the early 20th century, when the British Raj did a comprehensive study of its subcontinent territory and clocked its existence. There has always been a struggle for truth in India, and in the modern era of post-truth it feels as though this has always been the norm here. As such, little concrete historical evidence lends illumination to the past of Masroor, save for the fact that it was probably started in the 8th Century CE: similar, better-studied structures exist further south in Ellora Caves. The UNESCO World Heritage Site in Maharashtra is a far more revered site. 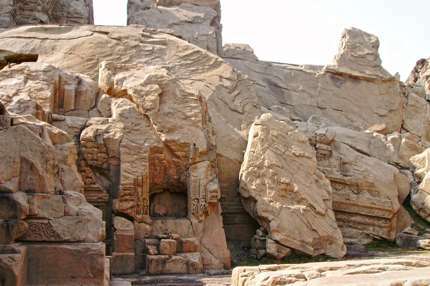 Much of the artwork there bears some resemblance, as does the rock-cut temple style, to Masroor. That is the scant link to the temple’s inception date. What is curious is that Buddhism was known to link the two places, as well as Hinduism, and both religions clearly had a strong impact on their formation. Looking at the side of the main tower, a carving of a figure looking remarkably similar to those of the Shakyamuni Buddha, seen around Dharamshala and McLeod Ganj, peered out over the land. It was supposedly Shiva, perhaps in fancy dress. Well before this time, India’s influence had begun to stretch out to surrounding regions such as Sri Lanka and Southeast Asia; the flow of religious and architectural ideas often accompanied trade, which is ever the vanguard of international relations. This does not go unnoticed in Angkor Wat in Cambodia, where the same shikhara style temple, started four centuries after Masroor’s, is rendered on a far vaster scale. The similarities are certainly not accidental. For example, the reflective qualities of the pond at the front double the splendour of both temples. The Angkor Empire had its beginnings as an Indianised state, originally known as the Funan Kingdom, in the 1st Century CE. 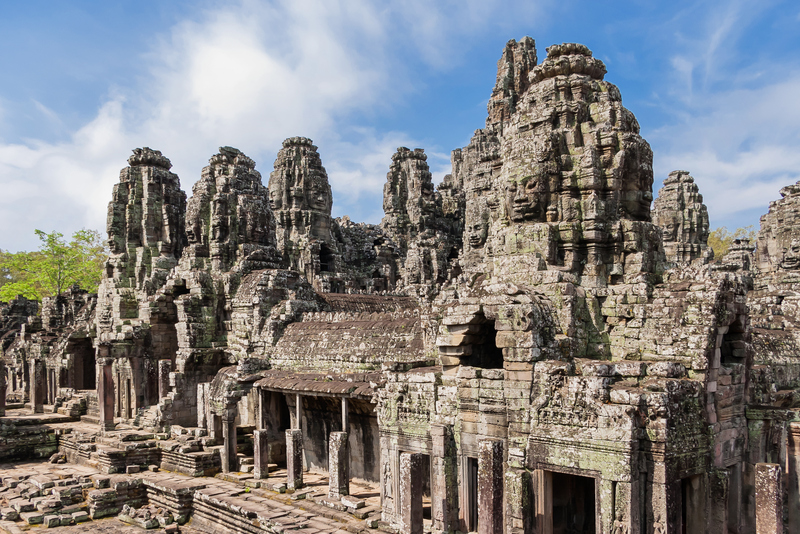 It continued to grow as a Hindu state with strong connections to India, until its strength became such that its size and wealth had grown, some 11 centuries later, to the point where Angkor Wat could be created in the capital of Angkor. That long period of steady Indian religious and political influence was almost undoubtedly represented best through the building of temples using techniques originally honed at Masroor. Another Indian religion, Buddhism, would later command Angkor Wat, where it holds fast still today. Over the doorway to the main altar at Masroor, cut deep into the rock, the depiction of the coronation of Shiva upon the lintel was one of the best preserved of the temple’s ravaged carvings. It was a delight to behold; Shiva’s posture here was with his eyes closed, sat very much like the Buddha is known to sit. The temple was dedicated to Shiva, as were many in this part of India. Angkor Wat’s main temple was originally dedicated to another Hindu god, Vishnu, a member of the Hindu Trimurti (trio of Gods, the other being Brahma). All around the temple there were signs of destruction by something other than the hand of time, and half complete carvings suggested a hurried cessation of work. 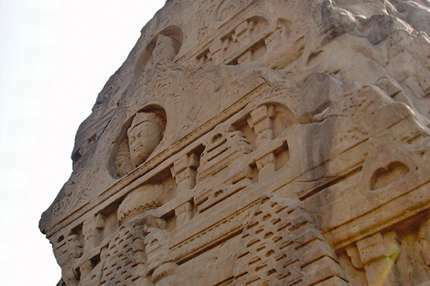 The temple was still being sculpted when Mahmud of Ghazni laid siege to the region in 1009. Recent theories suggest that it was one place where much of the local Raj’s gold and silver were stored, as it was assumed that enemies would expect Kangra Fortress to hold it all. Known as the ‘conqueror of a thousand temples’, Ghazni plundered the fabled wealth of the Kangra valley, Masroor and all. He destroyed as he went, yet Masroor’s saving grace was its construction from bare rock, rendering it virtually indomitable by human forces. At either end of the temple, the beginnings of other stairways remained unfinished. Feeble scrapings at sturdy stone. It was quite possible that the untimely arrival of Mahmud prevented the temple’s completion. Natural forces were to leave Masroor destitute at the turn of the 20th century, when, in 1905, a strong earthquake devastated the region, toppling Masroor’s stone pillars and ruining the northernmost shikhara. A narrow stairway, the steps a little worn through centuries of use, cut up through the rock onto the roof of the temple, atop which stood the remaining shikharas. The central tower remains intact, but the other nine were not quite so lucky. Some had lost half of their glory; others had been repurposed by gravity as a rockery of sorts besides the pond. Perhaps Masroor would have been far grander, far more revered had this not happened, perhaps even expanded in a manner similar to Angkor Wat. Instead the worshippers were nowhere to be seen. The shrines were simple and lacked the heaps of fresh fruit and votive candles seen at the Buddhist monasteries nearby. The chai wallah was asleep again. Masroor may have an obscure past and may not have been built in memory of a deceased love, or in celebration of an empire, but at least the voices of youth still ring out around its withered walls, lending life and colour to its incomplete form. 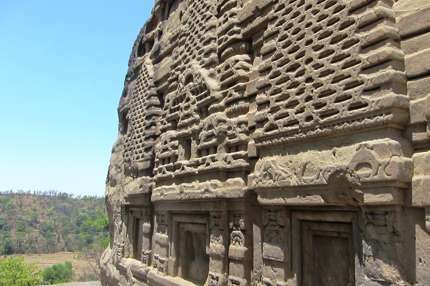 The Masroor Rock Cut Temple is open seven days a week, entry is approximately 5 rupees. The temple stands roughly 390km (242 miles) north of the Indian capital, Delhi, and 16km (10 miles) from the nearest major town, Kangra. Local transport can be unpredictable in the Himachal Pradesh region; the best way to reach Masroor is by hiring a car and driver from outside Dharamshala bus station or near the main square of McLeod Ganj. Prices, after a little bartering, can be surprisingly reasonable. Dharamshala Gaggal Airport, near Kangra, operates daily services to Delhi. Deep in the Strawberry Hills, near McLeod Ganj, the tranquillity of Fortune Park Moksha’s bucolic setting makes it an ideal choice if you’re looking to unwind, swim or just enjoy spectacular views over the snow-capped Dhauladhar Mountains. 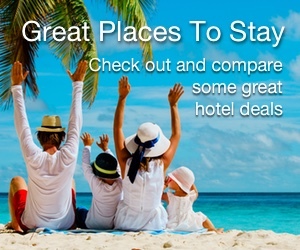 Double rooms start from £82 per room, per night (www.fortunehotels.in/mcleod-ganj-hotels.d.3).